— Paul Calle, who designed the United States' 1969 "First Man on the Moon" airmail stamp, died from melanoma on Dec. 30. He was 82. 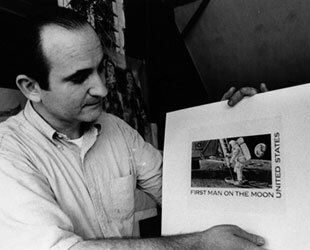 A prolific stamp artist with over 50 to his credit, Calle was also one of the first artists chosen by NASA to document the U.S. manned space program. 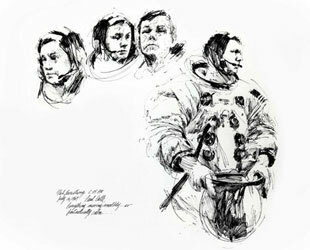 In a series of more than 40 sketches, Calle, as the only artist allowed in with them, captured Apollo 11 astronauts Neil Armstrong, Buzz Aldrin, and Michael Collins as they prepared to launch on their historic moon landing mission on July 16, 1969. 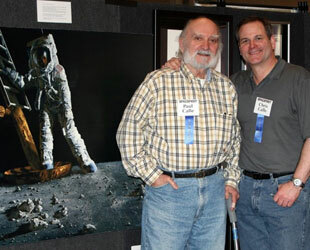 "I remember at one point concentrating on Neil Armstrong as he held his helmet," recalled Calle in 2009 for his son Chris' book, "Celebrating Apollo 11: The Art of Paul Calle." "Individually, I sketched the figure, then just the helmet, and then the portrait of the man who would be the first to step on the moon,"
Later that same day, as the astronauts left for the moon, they carried with them the master die for the stamp Calle designed commemorating that soon to be first step. Once returned to earth, the engraved plate was used to create the largest U.S. stamp released to that day. 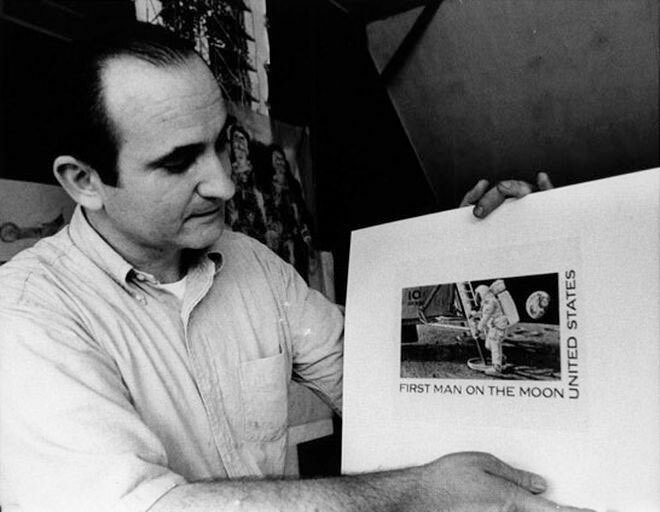 When finally offered to the public on Sept. 9, 1969, Calle's "First Man on the Moon" commemorative quickly became a very popular souvenir with over 152 million produced. Though that original moon issue was the most popular of Calle's stamps, it wasn't his first to celebrate the nation's accomplishments in space. Based on sketches he created during the earlier Project Gemini, Calle was approached by the U.S. Postal Service (USPS) to create two stamps commemorating the end of the two-man program. In addition to being his first stamp designs, the assignment presented Calle with a distinctive challenge. "The unique aspect of the challenge was to conceive a design that graphically would be pleasing when used as a double stamp, and, when one twin was separated from the other, the design of the single stamp had to be a complete composition of it's own," he said. 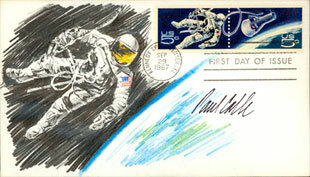 Calle's artwork showed an astronaut walking in space on one stamp and the Gemini spacecraft orbiting the Earth on the other. The astronaut's umbilical cable running from his spacesuit to the capsule connected both stamps. Calle's interest in space art preceded NASA's founding in 1958. In the 1950's, he painted covers for science fiction magazines, including "Galaxy" and "Amazing Stories." As one of the first eight to be selected for the space agency's burgeoning art program, Calle put to paper and canvas what less than a decade earlier had been limited to fodder for fantasy stories. He traveled where the astronauts went, sketching scenes that were otherwise behind closed doors or too remote for the public to follow. One of his first trips was to middle of the Atlantic Ocean aboard the USS Intrepid, covering the splashdown and recovery of the first Gemini mission. Along the way, he developed the style of art for which he would become known. "The Gemini work really was the beginning of a new career for me — my love of the pencil," Calle recounted. "I became known in the commercial world for my black and white drawings. Many people thought of drawings as preliminary to something else, I felt they were complete unto themselves — they just happened to be black and white." Calle's sketches, which stretched the length of NASA's activities from Mercury through the space shuttle and later extended to also cover the American West of the 1800s, are held in the permanent collections of the Smithsonian's National Air and Space Museum and Gilcrease Museum of the Americas in Tulsa, Oklahoma. "I had never seen anyone draw the way Paul did, with those bold pencil strokes defining shape and movement, capturing men and machines with uncanny realism," wrote "A Man on the Moon" author and historian Andrew Chaikin in his foreword to Calle's art book. In 1994, Calle — together with his son Chris, who followed in his father's footsteps, designing the U.S. stamp for the 20th anniversary of the first moon landing — designed two stamps for the 25th anniversary of the Apollo 11 mission. NASA flew half a million of the stamps onboard the space shuttle, which were then offered to the public through the postal service. Shortly before Calle's passing, the Smithsonian's National Postal Museum began an online poll to select a stamp to represent the United States in a new international gallery. Among the candidates selected by curators and currently leading the vote by a large margin is Chris Calle's stamp for the 20th anniversary of the moon landing. Although the stamp is intended to represent the country, should the younger Calle's stamp win, it will also serve a testament to the role the Calles' have had in documenting the nation's efforts in space. "Paul Calle's work proves that this country is not only able to produce scientists, engineers and astronauts capable of remarkable achievements, but also artists of equal ability," said NASA Fine Art Program director James Dean. "Good company on a long and sometimes perilous journey."